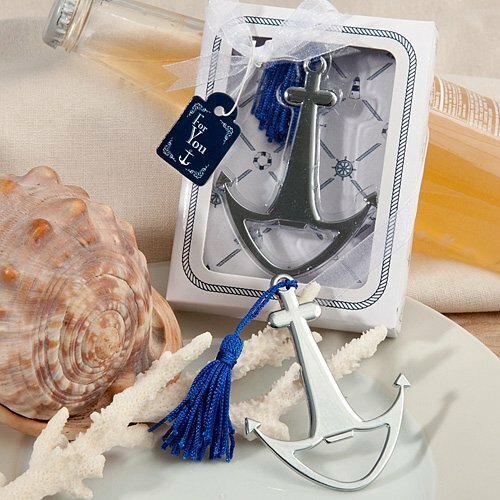 SHARE Great for use as nautical wedding favors, sailboat event keepsakes or as anchor themed favors, our Anchor Bottle Openers are sure to float everyone's boat! Complete with a blue satin tassel attached to the top of the anchor, the bottom of the shiny chrome metal anchor is the bottle opener. This functional favor is packaged in a nautical themed box with a clear window top that's frame with a braided rope design. The box is wrapped and tied with a white organza bow and an attached "For You" tag. Each measures 3 1/4" x 2 1/4" (6" with tassel). On the Nautical Anchor Bottle Opener Favors, can the rope be red? For this item, this is the only color available.